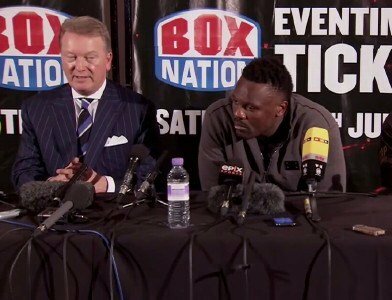 When British heavyweight titans Dereck Chisora and Tyson Fury clash this summer in a blockbuster rematch it could be an eliminator for the WBO World title promoter Frank Warren said today. The public will get to see both big men in action on Saturday 15th February when they both feature at the Copper Box Arena, Chisora headlines with a WBO and WBA International title defence against tough American Kevin Johnson – who replaces injured Andriy Rudenko – while Fury is chief support in a ten-rounder against experienced Argentine Gonzalo Omar Basile, live and exclusive on BoxNation (Sky Ch. 437/Virgin Ch. 546). Chisora has a score to settle with Fury who beat him back in July 2011 taking the Londoner’s British and Commonwealth belts plus his unbeaten record. Since then both men have gone on separate paths. Chisora turned his career around after losses to Vitali Klitschko and David Haye, to rebound last year with four back-to-back stoppages to capture the European and WBO and WBA International titles and is now ranked inside the top ten of three major governing bodies. Fury is still unbeaten and out of the six fights since Chisora, he’s stopped five early with Johnson the only man taking Fury the distance. Last time out he flattened Steve Cunningham in the seventh round in New York after he was floored in the second round. An action packed card at the Copper Box Arena features super-middleweight star Frank Buglioni defend his WBO European title against Gaetano Nespro, plus Bradley Skeete in a showdown against former world champion Vivian Harris for the Vacant WBA Intercontinental Welterweight title. An all star line up features former amateur star and unbeaten pro Thomas Stalker, Tyson Fury’s cousin and undefeated heavyweight sensation Hughie Fury, plus top talents Lewis Pettitt, Georgie Kean, Billy Morgan and Steve Collins Jnr. Next boxing news: Paquiao vs Bradley II – Who Learned More from the 1st Bout?